There's a full YouTube video of the launch concert for Daniel Herskedal's fine new CD Slow Eastbound Train (Edition Records). But nothing prepares you for the weight and density of his sound in a concert hall. 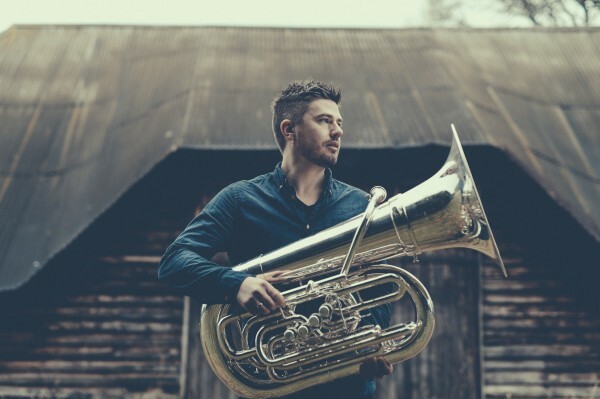 From the haunting opening theme onwards, his tuba and bass trumpet are the keystones of an ensemble that showcases this young Norwegian's increasing compositional prowess as well as his matchless command of the lowest register brass can generate. The ensemble centres on the composer in a trio with Helge Norbakken on percussion and Eyolf Dale's piano. The music also calls for a string quartet, featuring Kaja Fjellberg Petterson on cello - who doubled several tuba themes to thrilling effect - and filled out for this London show by three talented students from Trinity Laban, Christin Chai on viola and Jesper Gasseling and Olivia Holland on violins. They took on Herskedal's complex writing with aplomb, digging in to pieces that are often pastoral in mood, and rooted in jazz but betraying an increasing interest in scales and tones from other traditions - resulting in a kind of Norwegian world music. The opening couple of tunes, in particular, featured melody writing that called to mind Don Cherry, a similarly open-minded spirit. Apart from one self-accompanied piece, Mistral Noir, with Herskedal playing against some simple loops, it is effective ensemble music, but the emotional as well as musical heart of the evening lies in the leader's playing. He can make a tuba testify, yearn, lament, exult, or, as his listeners do, simply sigh with pleasure. This transfixing performance left a sellout audience well-satisfied, but shouldn't obscure the virtues of the shorter opening set from young Scottish pianist Alan Benzie. He served up 45 minutes of free-flowing, often Jarrett-tinged keyboard, supported deftly by Andrew Robb on bass and John Scott, stepping in at the last moment on drums for Benzie's regular drummer, stranded in Paris. His writing isn't as well developed as Herskedal's yet - one Ellingtonian piece veered close to pastiche - but on this showing here was yet another young talent who will be heard at the best jazz festivals a great deal more. Alan Benzie the most promising musician in a new wave of Scottish talents.